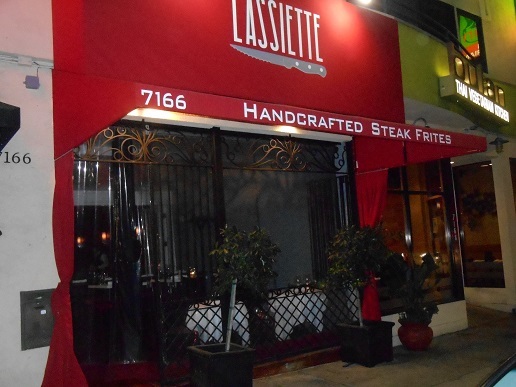 When I received the invitation to sample the cuisine at L’Assiette Steak Frites located at 7166 Melrose Avenue for dinner as a guest of the LA BEAT, I was intrigued by the offer. Nestled in West Hollywood, the neighborhood is known for its eclectic mix of restaurants, bars and entertainment venues. In fact, just up the street on near Fairfax, the neighborhood is going through a vibrant revitalization as even more businesses, shops and restaurants are clamoring for the steady stream of residents who live, love and enjoy the night life in West Hollywood. What can a restaurant do to stand out from the crowd of fresh new businesses emerging up and down Melrose Avenue? L’Assiette Steak Frites may have the answer. 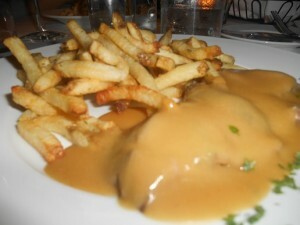 The signature dish Steak Frites. Turns out that L’Assiette Steak Frites, which opened up just this past March, is the new kid on the block serving up an old time favorite from France. 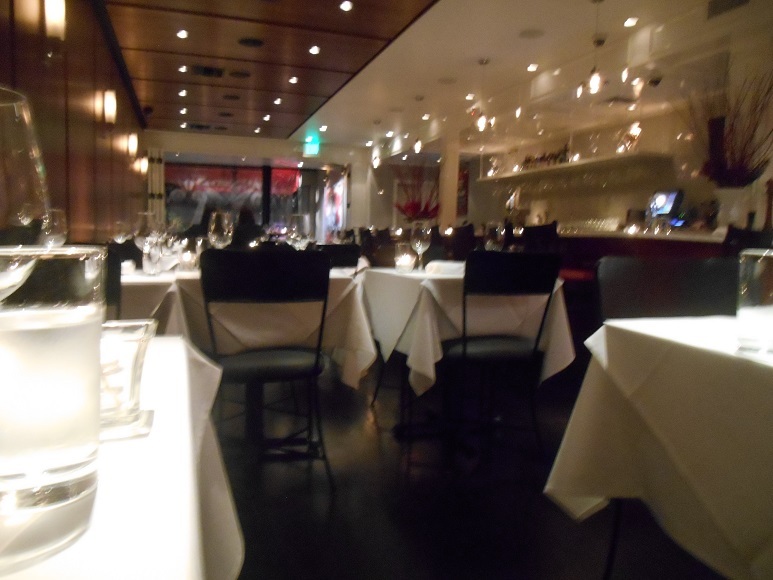 Its owner, Jacques Fiorentino, brought his favorite treat from France to West Hollywood where his restaurant serves only one dish. The Steak Frites is a platter of steakprepared sous vide style and served with a heaping portion of french fries. What is so special about steak and french fries? Well, for this non chef, who accidentally placed my carton of eggs in the freezer last week and still tried to boil them for lunch, I couldn’t have enough. Smothered in a special family recipe sauce that was gravy-like in consistency yet didn’t overpower the flavor of the steak, each bite literally melted in my mouth. Even my toothless grandma would enjoy the steak here. The fries reminded me of the fries at In & Out Burger, freshly made and delicious. The coolest part of the meal was the fact that you receive two servings at separate intervals so that the food will not ever get cold on your plate. Celebrate or relax in comfort. Pricing in at $25 for a soup, steak and fries dinner, L’Assiette Steak Frites,e seems to have the balance of price value and over delivery of an above standard dining experience just right. By walking into L’Assiette Steak Frites, you would expect that the prices would be higher to compensate for the service you receive and the classy ambiance which is a mixture of The Crustacean for its elegance and Dave & Busters because of the music that begs you to sing along out loud. Even if you are hanging out with a diverse crowd of carnivores and those who sing to their plants, L’Assiette Steak Frites, actually has a meal choice for everyone including a vegetarian version of the Steak Frite. You can easily walk into L’Assiette Steak Frites, after a fun night out at the movies or decide that you would like to propose to the love of your life there. Either occasion would be facilitated warmly by cozy restaurant with knowledgable servers like Josh who over extends himself to ensure a pleasant dining experience. 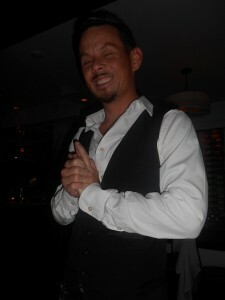 Josh, our server and comedic actor from the Bay Area. Speaking of Josh, no dining experience is ever complete without taking time to get to know your server. Our server Josh who bravely handled the hot plates like a pro during our meal, is an LA transplant from The Bay Area who has an extensive history in the restaurant business having served as a dishwasher, line cook, bartender and general manager of a restaurant before moving to Los Angeles 4 and a half months ago to try his hand at becoming a world-class comedic actor. Finding himself on the opposite side of the table again, smiling and describing the menu hasn’t dampened Josh’s spirits at all, commenting that he is amazed that he has made a life for himself so quickly in Los Angeles. With an extensive wine collection, a full service bar, a slurp every drop bowl of soup to start your meal and the laid back elegance of L’Assiette Steak Frites, I can’t imagine that the restaurant won’t become a favorite among those with discriminating palettes and the desire to experience the best West Hollywood has to offer. To cap off the royal treatment by beautiful staff, the restaurant is actually open until midnight, offering a special late night fare to satisfy those indulgent cravings. I think L’Assiette is a win for West Hollywood but really, I am not surprised. West Hollywood is consistently winning at each at every corner you turn.